Lawrence spent the final three months of his service life in Bridlington on the East Yorkshire coast; the ‘unfashionable winter resort’ as he referred to it in a letter written to Frederic Manning shortly after his transfer in November 1934, perhaps reflecting his growing mood of despondency as his discharge from the RAF grew nearer. cats and landladies’ husbands walk gently down the middle of the streets. I prefer it to the bustle of summer, because my February-looming discharge from the Air Force makes me low-toned. It is like a hermit-crab losing his twelve-year-old shell’. Lawrence had visited Bridlington a number of times previously on RAF duties, including a six-week stay in the summer of 1932. He was posted here over the winter of 1934-1935 to supervise the armour-plating of 10 diesel-powered launches that were to be used for RAF bombing practice. Work mostly took place in the RAF Marine Craft Detachment sheds which stood on the side of the harbour. 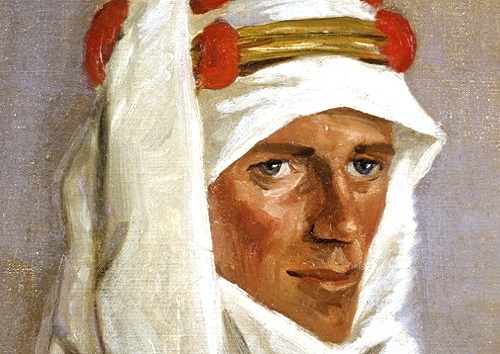 Lawrence’s identity was well known and press men used to hang about on the South Quay in the hope of catching a glimpse of him. Since the RAF vacated the old hangars in the 1950s, they have been converted into a modern building, known as the Lawrence Complex, housing a hotel, restaurant and fishing tackle shop. Behind the complex can still be seen the old slipway up which the boats would have been hauled for fitting out. During Lawrence’s stay in Bridlington, he and the other airmen lived at the Ozone Hotel, on a narrow triangle of land at the junction of Windsor Crescent and West Street; a striking building, even after many changes, resembling the prow of a ship, facing out to sea. 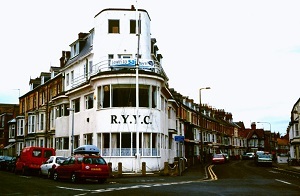 The old hotel is now occupied by the Royal Yorkshire Yacht Club. In an alleyway behind the building, visitors following in Lawrence’s footsteps might try to locate the garage where the proprietress of the Ozone Hotel, Hilda Barchard, kept her car and where on occasions Lawrence kept his Brough Superior motorcycle. of old photographs of Bridlington. 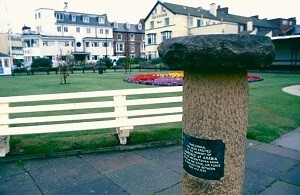 In South Cliff Gardens is a memorial sun dial inscribed with the words: ‘This sundial has been erected to the memory of Lawrence of Arabia who as Aircraftsman Shaw served in the Royal Air Force in Bridlington between 1929 and 1935’. It was on February 26 1935 that Lawrence received his discharge from the RAF and left Bridlington by bicycle for Clouds Hill. 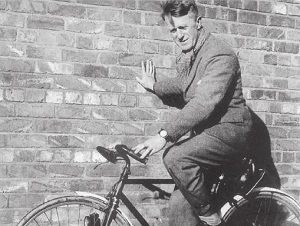 Wearing tweed jacket and flannels, he was photographed as he was about to set off by a friend, Ian Deheer, who had a boat-building business in Bridlington; leaning against a brick wall that was probably the side of Deheer’s office, by the bottom of the access ramp down to the harbour. It is the last photograph known to have been taken of him.